New Battle Looms Over The Most Volatile Issue In Policing: When Should Cops Shoot? Nothing gets more scrutinized and yet less questioned in the world of law enforcement than an individual officer's decision to use deadly force. Cops rarely condemn a colleague's decision to kill or wound someone — when it could have just as easily been them deciding to act to save their own life or someone else's. And local district attorneys almost never file criminal charges against an officer who pulls the trigger. DA's are guided by a legal standard that gives officers wide latitude when it comes to using deadly force. A bill co-authored by State Assemblywoman Shirley Weber (D-San Diego) and Assemblyman Kevin McCarty (D-Sacramento) would change that. AB 392 — reintroduced after failing last year — would curtail the circumstances under which police could legally use deadly force and make it easier for prosecutors to file charges against officers who shoot someone. CHANGING THE STANDARD FROM "REASONABLE" TO "NECESSARY"
Under the bill, peace officers in California would only be allowed to use deadly force "when it is necessary to prevent imminent and serious bodily injury or death — that is, if, given the totality of the circumstances, there was no reasonable alternative to using deadly force, including warnings, verbal persuasion, or other non-lethal methods of resolution or de-escalation." This stands in contrast to the "reasonableness standard" set out in the Supreme Court's landmark 1989 Graham v. Connor ruling, which allows prosecutors to focus solely on the shooting itself. That standard asks if an officer's use of force was motivated by a reasonable fear in the moment, given the officer's training and the circumstances at the time. The court also said "[the] 'reasonableness' of a particular use of force must be judged from the perspective of a reasonable officer on the scene, rather than with the 20/20 vision of hindsight." That means that if an officer reasonably believes you were holding a gun as he was chasing you down an alley — even though you were holding a cellphone — his shooting you is legal. "The current law talks about what is reasonable ... and what we're saying is, what is absolutely necessary?" Weber told the Sacramento Observer. "We're changing the standard and the language from a 'reasonable' position to a 'necessary' position for the use of lethal force." AB 392 would also empower prosecutors to file criminal charges against an officer if they determine he didn't do enough to de-escalate a situation. Police union leaders are alarmed by the bill. For one thing, they say putting officers in prison won't reduce officer shootings. "The punitive route is not the way to go," said Robert Harris, a leader of the Police Protective League, the union that represents the LAPD rank and file. Law enforcement groups also warn the bill could force peace officers to hesitate when confronting dangerous suspects and end up victims themselves. "They have to make a split second decision ... which is generally a survival decision," said Ron Hernandez, president of the Association of Los Angeles Deputy Sheriffs. After failing last year to stop landmark legislation forcing police to give up long secret records related to shootings and other issues, 11 unions are taking what they're calling a "more holistic" approach in their effort to defeat AB 392. They've created a group called Protect California and are offering their own solutions to reducing police shootings. It might be described as a kinder, gentler form of lobbying. "We're taking a step back instead of just flat out defending law enforcement," said Hernandez. Protect California supports SB 230, competing legislation that seeks other ways to reduce police shootings, including providing more training to officers. The measure, introduced by State Sen. Anna Caballero (D-Salinas), would tweak state law with regard to when officers can use deadly force, but it would maintain the Graham ruling's "reasonableness standard." The Protect California strategy is a sign that things may be evolving in a state where law enforcement has played a powerful role in shaping policy. "Like any effective political force, they are adapting," said Raphe Sonenshein, executive director of the Pat Brown Institute for Public Affairs at Cal State Los Angeles. Along with its lobbying on the competing bills, Protect California is proposing other measures that might help reduce officer shootings. Harris, who's also the coalition's president, wants legislators to budget $300 million for more training on de-escalation during confrontations, as well as how to interact with mentally ill people. SB 230 doesn't include a dollar amount for training. "Let's get the funding in place to make sure that all officers are receiving the training that they've been asking for," said Harris. Current training is a hodgepodge around the state, he said, adding that in some departments training to deal with mentally ill people amounts to just "checking a box," with requirements as basic as a 20-minute video. 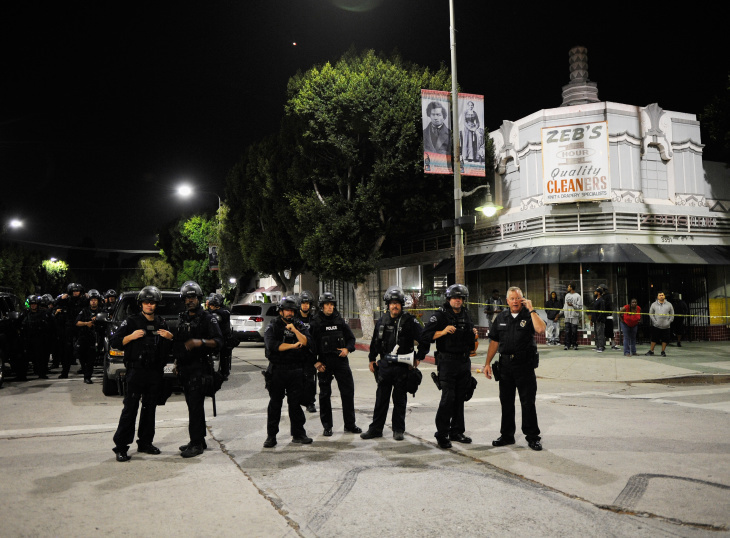 A recent LAPD report found that one in three instances of use of force by its officers involved someone with mental illness. Hernandez of the deputy sheriffs union said police are prepared to criticize other cops, but only if they're given more training to do their job. "If you want to hold officers accountable, then train them up to the point where even we as individuals will look at it and say, 'Yeah, that one was a big mistake," Hernandez told LAist. Along with calling for more training, Protect California is arguing that better economic opportunities can reduce police shootings and other uses of force. So it says it will advocate for things like more building trades apprenticeships and economic enterprise zones. A plumbers and steamfitters union in Northern California has joined the effort. The coalition also backs Attorney General Xavier Becerra's call for more funding to get confiscate guns from felons, the mentally ill and others who have been ordered to hand over their weapons. SO WHY THE PIVOT BY POLICE UNIONS? For decades, police unions wielded tremendous power in Sacramento. They contributed a lot of money and lawmakers who opposed their agenda faced the prospect of being labeled "soft on crime." That reality led to California — known for its increasingly liberal politics — becoming one of the most secretive states in the nation when it came to police accountability. The politics are different now. The crime rate is down. Voters approved a series of propositions reducing prison sentences, including Propositions 47 and 57. Then came last year's fatal shooting of an unarmed black man in Sacramento, which sparked widespread public outrage. In that case, Stephon Clark was chased into his grandparents' backyard and shot dead as he held a cellphone in his hand. Sacramento police pursued Clark because they suspected him of stealing things from cars. This month, local and state authorities said they would not press charges against the officers who killed Clark, sparking a new round of protests in Sacramento. Clark's killing, among a number of notable police shootings of unarmed black men, raised questions about whether the current standards for using deadly force are outdated. The Clark killing also played a key role in the passing of the police transparency legislation, SB 1421. The new law requires the release of personnel records long kept from the public. The records now available under the law involve officers and deputies who shoot and use other serious force, commit sexual assault on the job and fabricate evidence. More than 20 police unions around the state have sued to challenge the scope of the law, arguing that records that predate the law going into effect should not be included. Judges in L.A. and Orange counties have ruled against the unions. In response to SB 1421, KPCC/LAist has joined with more than 30 newsrooms across the state to form the California Reporting Project, to share Public Records Act requests and the files we get in response. So far the project has filed more than 1,100 records requests with 675 agencies in all 58 California counties. Partners have received at least some records back from 134 agencies.